The middle school transition has been identified as a diﬃcult time for youths, resulting in adjustment diﬃculties across a variety of domains. Although some research has examined strategies that are useful for the adjustment outcomes associated with the transition, more research understanding student perceptions of what is helpful in the middle school transition and adjustment correlations of perceived level of diﬃculty is needed. A recent issue of the journal Children & Schools, published by NASW Press, includes an article which describes a study of this issue. This study surveyed 84 youths approximately 2.5 months after their transition to middle school. Parents were perceived as helpful by almost all students (>90 percent), followed by friends, then teachers. In addition, locker time before the start of school and a tour of the middle school while still in fifth grade were endorsed as helpful by the majority of the students. Approximately 29 percent of students reported that the middle school transition was diﬃcult, and high levels of transition diﬃculty were associated with poorer adjustment for both boys and girls, specifically high levels of depressive symptoms and schoolwork diﬃculty. The article concludes with suggestions for transition strategies. The journal Social Work is a benefit of NASW membership. It is available online or, at a member’s request, in print. 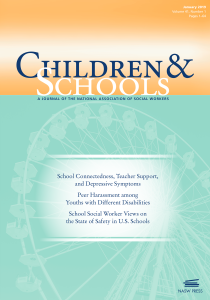 Children & Schools, Health & Social Work and Social Work Research are available by subscription at a discounted rate for NASW members, either online or in print. You can find out more about the journals and subscriptions at this link.